I got to meet two innmates and spouses at the PAII Conference last week in Charleston. It is great to put faces to names! Well perhaps next trip I can tag along? What fun! By the way he had excavators you can drive too, that would be fun for next time! Move some dirt! They need to include that shot on the 'We're Innkeepers' BWTS video! But they would have to admit there are some small B & Bs if they did that. I GET TO MEET ANOTHER INNMATE! Thank you everyone for being so awesome. I am meeting an innmate in PA. I can't recall how long I have known this innmate, but I recall that we said when our daughters were around 12 or 13 years of age that it would be fun for THEM to meet and share innkeeping horror stories, as the kids at the inn! Now mine is 17. TIME Flies! Enjoy every minute, love them while you have them, if tomorrow was the last day, make today count! Out here in the west, we have so few of us who are on the forum. I would love to do a trip going from inn to inn! BD, I know the feeling. I was just fortunate enough to be not so terribly out of the way and near a big city they were itching to see. This was sorta that way tho BD, we went MIDDLEN (sheesh I am having a spell check error day today) middlin'? how to spell that, anyway, midwest! We went central. I had never been to any of those places so it was awesome for me, personally. Now I am talking to people from there all the time. Someone I know his son is a forest ranger in the Mark Twain National Forest in Missouri, I told him "Hey I was at the Mark Twain Lake and the state park was right there and the marker from Mark Twain's birthplace" So it is a small world, indeed! Sorry but Mark Twain National Forest is south of St Louis.. . no where close to Mark Twain Lake. But I was in Missouri! And a little Mark Twain ...like where he was born. I got a plug in for this great lodge I know about on a lake there. Out here in the west, we have so few of us who are on the forum. I've seen this in many forums over the years, where there are very few members from the states with big populations and lots of participants from little out of the way places with low population. Maybe bigger places have active local associations, and those of us in the middle of nowhere need an online community. I think this is better! Yes there is a conglomeration innmate factor where we all meld together right here fairly well. I MAY be meeting an innmate at the end of this month, one I have known for a while and never met...I have sent the email out. It may work out...I hope so! We have plenty of still photos as well... I was just on dropbox trying to get K9's photos to her. I was standing at the wrong angle - and by the time I got my video camera Joey was back in the gate - but I go some nice footage of K9 driving. Will load it to a DVD and send it to her. It will be a regret until the day I die that I did not trust my knees UNLESS I get back there and do it. My daughter is hyped. And our Chief of Police wants to do it SO BAD!!!! You're not the first who has said that! 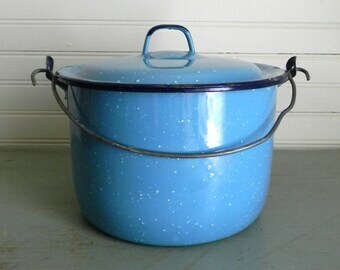 Back in the 80's she had been on a trip out west and bought a big spatterware pot that was too big to pack in her suitcase so she carried it on the plane coming home. As she took her seat with the pot in her lap, the man next to her really gave her a look. Without missing a beat she told him, "I get really sick when I fly." This trip ranks up there as one of my favorites!